This is the sixth installment in the series, The 3D-Materialization of Art, an ongoing survey tracing the new and growing movement of highly-reflexive 3D spectacle and narrative art and activism. Made by artists who distance themselves from the commercial uses of 3D in motion pictures, television, advertising and gaming, the new 3D artists employ the same technology that the commercial industries use. The difference is the 3D-materialization artists extend the dematerializing values and strategies of Conceptual Art to digital imaging, narratives, mythopoetics, satires and paradigms that promote progressive and sustainable political, cultural and natural lifestyles for the present and future. The preceding Huffington Post features in the series include commentaries and criticisms on the 3D art of Claudia Hart, Kurt Hentschlaeger, Matthew Weinstein, Jonathan Monaghan and the bitforms gallery exhibition, Post Pictures: A New Generation of Pictorial Structuralists A related article includes the digital art of Morehshin Allahyari in a particularly global feminist context. 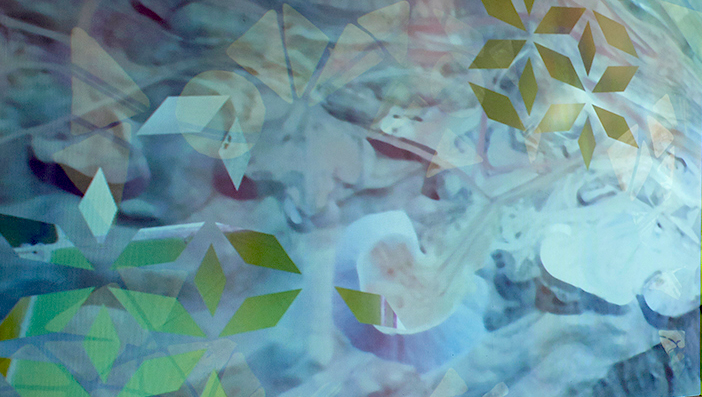 Monika Bravo, Tesserae 05, 06, 2017, media player, projector, SD card 1:37 min, installation view, Johannes Vogt Gallery, New York, curated by Octavio Zaya​, © ​Mari Juliano​. Much of the work discussed in this post can be viewed at the Johannes Vogt Gallery, New York, through February 26, 2017. It is rare that an art or a medium that is self-reflexive about its structure, its operations, its effects on the viewer, and about assuming a visual strategy that is largely abstract and process oriented, is also preoccupied with its own historicity, it's own capacity for pictorial representation, it's own conciliation of fiercely defended ideological oppositions. But these are just some of the contradictions posed by Monika Bravo's vector art of abstract-representation. 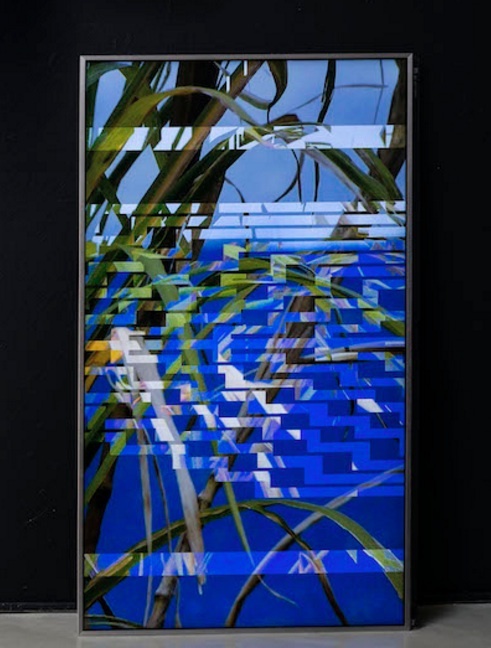 Yes, abstract-representation sounds like a non sequitur, but the work that Bravo has exhibited at the Johannes Vogt Gallery on the Lower East Side of Manhattan is focused on making the conciliation of such opposites a presiding philosophy of vector art. Even the passage from the street into the Vogt Gallery imposes its own powerful epiphany about opposites in dialectical relationship, about ideas outliving their time yet resisting the new order, in this case the ongoing and likely unreconcilable conflict between an ascendant cultural relativism and the political orthodoxy set on obstructing that relativism's advance. For upon reaching the gallery's location near the intersection of Chrystie Street and Canal, my attention could not but be drawn across the street by the huge yawning portal of the Manhattan Bridge sitting like some giant sphinx of modernist American engineering guarding against a newer, likely foreign technology. As my eye traced the bridge's ascent to the American continent that Manhattan Island defiantly remains aloof from culturally and aesthetically, I became aware that Bravo, a Columbian immigrant-turned-citizen, introduced her art in a sanctuary city more attuned to global history and culture than to the static provincialism of the continental United States, especially amid Trump's anti-relativist America. But as this particular series of work by Bravo is largely apolitical, I was grateful for once to escape the dark cloud looming over the nation to partake in a meditation on what new media and ancient media together can tell us about time and consciousness. Inside the gallery, the digitally, seemingly-abstract animated paintings of Monika Bravo, and the inspired curating of Octavio Zaya, spoke to me of the vital new direction for painting. Should we call video painting? Definitely. In the 1960s and 1970s Dan Flavin, Marian Zazeela, and James Turell presented light as an essential formal component of both painting and sculpture. We're not calling it 'paint', after all, which is the skin of traditional painting. Painting is an optical art, and thereby light's color alone merits it to be called painting. But animation is not just revitalizing painting, but abstraction. That is abstraction that is both authentic and ironic (yet another pair of opposites to reconcile) in being taken up as vital components in the structure and language derived from the negotiation of abstraction and representation as renewed by the epoch of vector imaging. By understanding that abstraction and representation are two sides of the same coin, we also come to understand that abstraction isn't just a modern or Western invention, but a universal cognitive process that enabled the evolution of linguistic, visual and material expressions of representation since the dawn of human consciousness. In this larger sense of abstraction/representation as reciprocally interchanging within all meaningful structures, we mustn't get bogged down in the stylistic geometric abstraction that Bravo visits. Monika Bravo, Left: Tesserae 05, 06, 2017, media player, projector, SD card 1:37 min. Center: Tesserae 01, 2017, vertical 70″ monitor, plexiglass, masking tape, wood, paint, media player, SD card 15 mins. Right: Tesserae 04, wood, paint. Installation view, Johannes Vogt Gallery, New York, curated by Octavio Zaya​, © ​Mari Juliano​. "In the center of five monitors, three projectors, and sound, the viewer undergoes a hyper- rhythmic sensorial stimulation. In this activated state, on the one hand, Bravo is superimposing layers on LCD screens to help us enter into a new cognizance, where perception is mediated between what is real and what is virtual. On the other hand, another set of projections will be countering that experience: bursts of patterns of tiles, masked with Google image captures of Earth, will pulsate around the room as the silent beat of an imaginary musical score." In these projections, abstract motifs we may recognize from art history or design are superimposed upon large-scale pictures of nature and civilization accessed through Google Images. So as not to get mired in arguments of historicity (periods, styles, originality or lack of), which are secondary to this work and, anyway, have been done to death over the last century, Bravo is neither concerned with revising geometric abstraction as a nostalgic trope, as a zealous historicist might do, nor is she posing an ironic mimicry of historicism to critique the epoch of abstraction's indifference to cultural upheavals, as Peter Halley and Phillip Taaffe did in the 1980s and 1990s. Above all she is rejecting the snide authoritarian critics whose "painting is dead" mantras dismiss current artists' forays into abstract art as so much "zombie abstraction". If there are many historical aspects to the Vogt Gallery Tesserae installation, it is because Bravo's digital art surveys the full spectrum of visual language shared by painting and electronic screens to convey how capaciously the most time-honored modes of both formalist abstraction and pictorial representation can be adapted with vitality to new emedia while yielding a reflexive semiotic and methodology of imaging uniquely its own. Even the title of the work, Tesserae, meaning mosaic, conveys the process by which a great macrocosm of a literal idea or a realistic image is made up of many microcosms, some abstract, some pictorial. The first video on this page, Tesserae 05, 06, exemplifies the continuity between the visual processes of abstraction and pictorial articulation as an explicit outgrowth from form-to-structure-to visual language-to signage. The two subsequent videos, Tesserae 02 and Tesserae 03 & 04 predominately display familiar compositions of hard-edged geometric abstraction visited by animated pictures so discreetly integrated within the lines of the abstraction that they seem at first glance to be abstractions themselves. 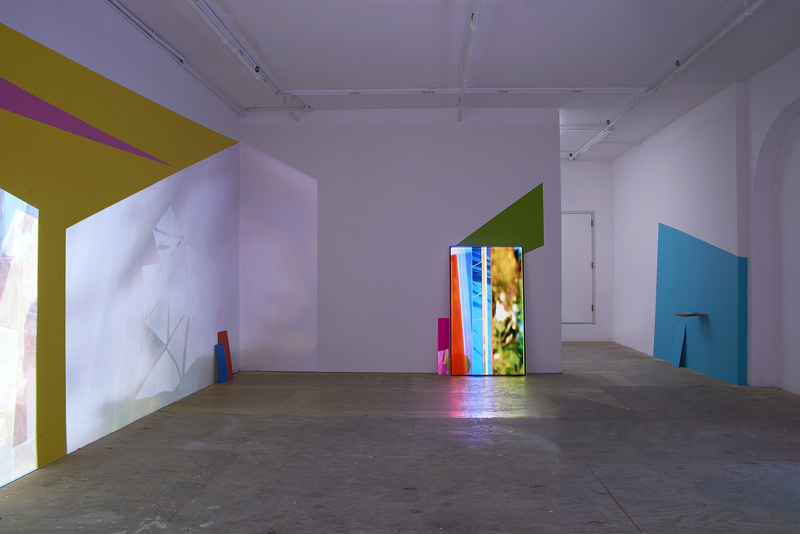 Monika Bravo, Tesserae 02, 2017, diptych, 2 vertical 70″ monitors, plexiglass, masking tape, wood, paint, media player, SD card 15 mins, installation view, Johannes Vogt Gallery, New York, curated by Octavio Zaya​, © ​Mari Juliano​. Here is where Bravo and Zaya ended the exhibition. But I'm here including an additional work, URUMU (Weaving Time), 2014, shown in two earlier installations at The Bard Graduate Center and Christie's West Galleries, to emphasize that Bravo understands the full extent to which abstraction informs the basic components of pictorial representation -- fully comprising even what we call realism. (In fact, the earlier date of this work implies that Bravo first had to explicitly work out a scheme that grew full-fledged pictorialism, replete with resoundingly emphatic signage, from the most minute alignment of vectors in order for her to feel confident about displaying that same semiotic evolution, from abstraction to pictorial signage, more subtly and with greater nuance in the Tesserae. Monika Bravo, Left: Tesserae 02, 2017, diptych, 2 vertical 70″ monitors, plexiglass, masking tape, wood, paint, media player, SD card 15 mins. Right: Tesserae ​03, 2017, diptych, 1 horizontal, 1 vertical 70″ monitors, plexiglass, masking tape, wood, paint, media player, SD card 1:37 min. installation view, Johannes Vogt Gallery, New York, curated by Octavio Zaya​, © ​Mari Juliano​. These are only the most renowned art historical instances to have compelled Bravo to turn to the century-old theory of time summarized by the metaphysician, Henri Bergson. Much the way that Cézanne isolated the timing of each brush stroke, Bergson saw time as we know it by experience as quantitatively different from time as we understand it intellectually to comprise both the instant of life in the living, and the totality of time we live out. Bergson explained that both the illusion of the instant and that of the totality, are but abstract concepts that tell us nothing about the duration of time that we experience as a bracketed continuity with a beginning and end. Bergson understood that art was changing our view of time by turning us away from the idea of time as an absolute, and toward a view of time as made up of bracket parts we remember and call durations. Even more popularly after the Lumieres, motion pictures represented a perpetual flux that, though the medium allowed replaying, the fragile and precocious materiality of cinema combined with the changing conditions (of light, temperature, temperament) that could never be rendered identically. Bravo and Zaya together chose to integrate the modern lessons about time derived from Cézanne, the Lumieres and Bergson in the Tesserae show. And they did this by choreographing the shadows and interactions of the gallery viewers into the installation by making the light of the central overhead projectors more than just a medium. The light is as well made a collaborator with the visitor to the installation when they together improvise the intervals of shadows blackening the images projected. Bravo and Zaya hereby pay homage to the legacy of the performance art that grew directly out of the action painting of Pollock -- those artists of the 1950s and 1960s who saw themselves as literally breaking out of the frame of painting, photography and cinema to make their actions in time itself a feature of visual art. In connecting with this history, Bravo and Zaya saw to it that we could never merely experience the installation through photo and video documentation, like those posted here. They were intent, rather, that the full audio-visual-tactile ambience of the painting-in-space would only be experienced with a visit to the gallery itself. There is one problem, however that Bravo's vector paintings invite, at least to the impatient viewer. Anyone not aware of vector practice today, yet perhaps too-well versed in the history of modernist painting, might likely walk into the Tesserae installation (or its recreation), and despite the flickering light of video, the chromatic aura of the LCD screens arranged around the space, and the shadows of viewers integrating with (not merely obstructing) the projections draping floor, ceiling and walls, might fall prey to recalling the formalisms of Malevich, Kandinsky, Klee, Mondrian, Robert and Sonia Delauney, Reinhardt, Newman, Dibenkorn, O'Keefe, etc. Or they might invoke the history of the diverse, yet systematic hard-edged geometric movements of De Stijl, Suprematism, Constructivism, Bauhaus, Minimalism, Neo-Geo. Such historically adept viewers might in haste feel there is nothing new here in terms of painting and walk out. 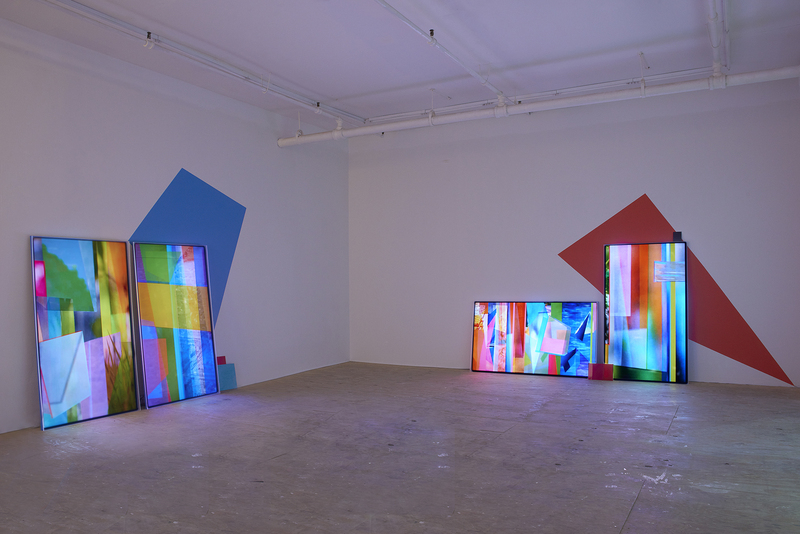 Monika Bravo, Tesserae ​03 & 0​4, 2017, diptych, 1 horizontal, 1 vertical 70″ monitors, plexiglass, masking tape, wood, paint, media player, SD card 1:37 min, installation view, Johannes Vogt Gallery, New York, curated by Octavio Zaya​, © ​Mari Juliano​. For the informed vector enthusiast, however, the Bravo installation sustains a long investigation not just for the history being echoed by a (fairly) new medium, but for its visually-enhanced allure, even a cultural aura -- things digital art often lacks. That allure and aura have nothing to do with the history being evoked, but the hypnotic resonance of alterations unfolding in each screen and projection that speak of relativities unleashed, even magnified, by the fluidity and virtuosity of the vector graphics that, in a single composition, can simultaneously imply legacies as recent as the invention of modernist hard-edged abstraction and as historical as the invention of the science of one- two- and three-point perspective in the Renaissance. Just the use or viewing of vectors makes an artist or viewer predisposed to historicism given that vectors proceed from the invention of perspective as a tool for art and architecture.There is also a sense that training in vector imaging, like training in perspective drawing, inclines us toward relativism. This much was discerned in 1938 by William M. Ivins, Jr., then the curator of prints and drawings at the Metropolitan Museum in New York, when he wrote that the Theory of Relativity that Einstein conceived would likely not have been postulated without an understanding of the shifting vision of perspective in the eye. More than any of her past exhibitions, the Tesserae show affirms that Bravo shares the historicists' agenda. But she also returns to the reflexive mirror of media about media to recontextualize the modernist lessons of abstraction as a philosophy of our individualistic relations to history and nature. Even the amateur historicist can see in the Tesserae work the legacy of geometric abstraction in art, along with the myriad variations formalist critical argot. Some of the language is long forgotten: the 'kinevisuality' of critic Umbro Apollonio (his name for Op Art); the 'iridescent interpenetrations' of Giacomo Balla; the 'luminism' of Larinva and Goncharva. The imagery of such artists, however, invoke, if only superficially, the linearity and overlapping of Hans Richter, Sophie Taueber-Arp, Frank Kupka, El Lissitzky, Diebenkorn. An earlier work by Bravo, URUMU (Weaving Time), shown in 2015 at Christies West, New York, while superficially evocative of circuit boards, on the other hand recalls the rhythmic and highly regulated lattice paintings of Yaacov Agam or Carls Cruz Diez, that optically move with the eye in essays of intricate and relativist optical illusions. Nothing in Bravo is an optical illusion. It's all straightforward vector graphics, cinematic camera and google images. Solarization, rayograms and other Surrealist techniques appear to be at work but are not. It's all vectors programmed for effects, while often by chance appearing like an early employment with paint and optics. ""My process? I use a computer but it is a purely painterly process. Rather than employ a programmed script to execute each part, I implement manual execution within the computer frame. I create a method or system in my mind, and then it is executed first by hand and then by combining two programs: illustrator, which creates the vectors, and then after effects, which enables me to create the movement by hand. My choice of using the computer to still simulate Manual actions is what I consider rendering a materiality to the ones and zeros." Bravo makes it clear that the reinvention of painting as a 3D medium and consciousness is the central issue from a variety of standpoints, one of which is its departure from art history to sketch out the origins of the parameters of the vectors found in the legacy that informs her work both structurally and as conscious history. "I've departed from Sonia Delauney in the fast google video. This comes after I referenced Delauney's color inspiration in URUMU, a 2014 series of glass studies for weaving time. I've also been influenced by Malevich, and am intrigued that so many of the early Modernists were somehow connected to ideas of the divine, the intangible, the non-objective, though history has stripped the spiritual component in art because it confuses it with the religious. I have since I remember always been a very spiritual child, with all the good and terrible connotations it implies for the immateriality which connects us." One of Bravo's smaller works in the gallery's office is a Malevich-like composition on a 24" x 36" screen that can be hand held to view from different angles. It is a work that upon turning so that we peer at it from is side makes us aware of how rarely, if ever, we look at a painting or drawing not frontally, but laterally (at 90 degrees) from which we see only a surface line. Because the streaming motion, like a video, is so much more accomplished in terms of the fluency and subtlety of motion than was the primitive kinetic art of the 1960s, Bravo's work evokes the cinematic process brought to her work, not only by the screen, but as well by the pictorial motion she defines with the use of parallelograms and by the converging and diverging lines that launch perspective drawing into temporal pictorialism. Bravo sees the kinetic action of her screen version of painting acting as the programmed version of memory, while the breaks with that memory, the disjunction and "splicing" (to use an antiquated cinematic technique as legacy rather than process) to expand her media vocabulary into pictorial iconographies and semiotics, as well as the merging of paintings, cinema and video. Bravo's equation of media around the installation space (painting + animation + video + sculptural + performative space) add up to visualized essays on consciousness, but also of the contradictions and conflicts that come with the discontinuity that different consciousness imposes when people of different backgrounds converge, as she personally, as an immigrant, is painfully aware. Which is why the different techniques in her work not only enact, but emphasize disjunction and discontinuity. Amid the intersecting lines and overlapping shapes, the hard edges and simulated brush strokes, imitation washes, even vectored effects of painted sfumato and scumbling, there are flashes of photo-generated water rippling in pools, rain on a leaf, light penetrating shrubbery, reflecting glare bleaching out pictures of thriving life. Or there are aerial views of unspoiled terrain phasing into urban centers, concrete giving way to floribunda. The disjunction amid these groupings is an operation that Bravo likes to associate with schizophrenic discontinuity. Normally I object to the formalist disjunction in art being labeled schizophrenic, since schizophrenia is disruptive of choice when art is largely choice. But this time the description came to me a month after I finished writing about Agnes Martin's grid paintings mapping a continuity that became the artist's escape from the disruption of life imposed on her by the schizophrenia that plagued her for decades. Bravo, by contrast, maps a tentative and uncertain entry into the schizophrenic's crisis of breaking with continuity, if only to experience what the breakage from a continual reception and understanding of visual language tells us about how abstraction in mental picturing supplies the cement needed for living productively. Similarly, in Bravo's art, abstraction is the cement for vectoring together a simulation of the mental pictures that, like building blocks, compose our experience of the world, our reality-in-time. Art historical influences, quotations and analogs: Kazimir Malevich, Suprematism, 1916, oll on canvas. Sonia Delauney, Untitled, 1947, gouache, colored crayon and pencil on paper. Richard Diebenkorn, Ocean Park #79, 1975, oil on canvas. Peter Halley, Rogue, acrylic, roll-a-tex/canvas, 1986. "Time, as perceived in the Western tradition, is linear", Bravo adds. "It creates anticipation and a sense of narrative that has already been established in the history of writing and movie making where there is an anticipation of something that will end apocalyptically, of someone who will messianically come again. All information within this timeframes moves in a perpetual straight line. The eastern traditions observe time, they follow nature: a river doesn't stop flowing between countries unless a mind chooses to stop it." "This is, by the way, the connection to the Google images, a personal annotation of how the machine swallowed me. I show nature that circles in time. And recently my source for the images have been drones that pulsate so fast." When I asked Bravo what she takes from cinema, she cited the most painterly of recent film directors. "Greenway tried to explain the relationship and difference between cinema and painting in the 1990's when he was cutting and pasting elements into his frames. It was in The Pillow Book that I saw he was intervening on the screen by creating screens within screens. That made me stop and ask what defines the screen, the frame, the format. And I am still there going beyond the screen, going inside and outside the machine, the medium, the drawing, the wall, the color, the idea of what a structure and process is. As in the Tao. You cannot name the Tao. A painting cannot be defined. When you try t define it, it stops being what it is, something that moves you, that connects in other levels that most of the times are not tangible, whether rational or emotional." Monika Bravo, URUMU (Weaving Time), 2014, 1 channel monitor + media player. It was in watching The Pillow Book that Bravo foresaw the Tesserae series, though more as an external skin than as the mosaic it bacame. "The medium, whether it is paint or screen, is like the skin of the body, a vessel. When we define it too much, it loses its magic. I am just using and intervening on the space beyond what is established, what is expected, because my aim is to create an experience that others can take elsewhere. So again, Greenway tried to depict this relationship, the difference between cinema and painting. When I saw this back in the 1990's, I knew I was on the right path, I just needed to create my own language to convey it." Create her own language, Bravo does. But the one disappointment in the Tesserae series is that Bravo does not elaborate the pictorial imaging with as much precision, clarity and cohesion as she bestows on the abstract components. 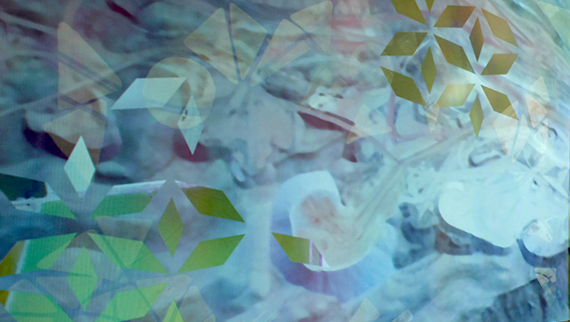 Part of this is because Bravo relies on rather bland, appropriated imagery from Google instead of photographing or simulating objects that are as richly developed as the abstract videos, or as evocative of the power of the sign in imagery in her 2014 work, URUMU (Weaving Time), a 4 channel projection seen in the fourth video here that bears fleeting resemblance to Hollis Frampton's 1966 structuralist masterpiece, Zorn's Lemma, if only a slice. Rather than accessing more appropriated imagery in her work to come, Bravo might profit more by advancing an alternate pictorial reality, one engineered by visiting her modeling and effects program to map out an entirely authentic scheme for reconciling the imagery of abstraction and representation. Is this a picture of reality or an abstraction after Sonia Delauney? It's both. Bravo lifted graphic diamond clusters from Sonia Delaunay's Moroccan and Portuguese tiles and vectored them onto aerial photos that she acquired from Google Images, specifically those with patterns complementing Delauney's. From Tesserae 05, 06, 2017, projected at the Johannes Vogt Gallery, New York. Listen to G. Roger Denson interviewed by Brainard Carey on Yale University Radio. Read other posts by G. Roger Denson on Huffington Post in the archive. Follow G. Roger Denson on facebook.